Barcelona is the capital of Catalonia, an autonomous community of Spain. 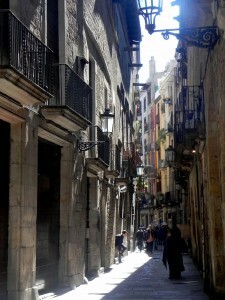 It is the second biggest Spanish city and one of the trendiest city in Europe. Barcelona is divided into different emblematic neighbourhoods each with a distinctive personality and atmosphere: Ciutat Vella, Eixample, Raval, Sants-Montjuïc, Horta-Guinardó, Les Corts, Gràcia, Sarrià – St. Gervasi, among others. One of the strongest assets of Barcelona is its Mediterranean climate, with mild temperatures throughout the year ranging between 10º (January and February) and 30 ° (July and August). Not being a particularly rainy city, you can enjoy the sun most days of the year, winter or summer. This makes it easy to visit the beaches of the Mediterranean Sea, parks and hills surrounding the town. The official languages ​​in Barcelona are Catalan and Spanish. Although Catalan is important for culture and traditions, Barcelona is a bilingual city where everyone understands and can talk in any of the two languages. If you are a foreigner and you intend to stay for a short time, communicating in Spanish won’t be a problem. However, if you intend to stay for a longer time, learning Catalan can enrich your experience of the city. Barcelona is a city with a great cultural, artistic, historical and architectural tradition. You will be able to enjoy a wide range of activities, exhibitions and conferences offered daily. Don’t miss the opportunity to visit landmarks such as the Museu Nacional d’ Art de Catalunya and the Liceu de Barcelona as well as small theaters throughout the city or street parties held in every neighbourhood. All those students who need a visa to study in Spain, have to go to the Spanish embassy of their country to request it. Moveo provides all admitted students all the necessary documents for procedures related to visas and scholarships. The school has an accident insurance that covers medical expenses that may arise during classes or presentations for all Moveo students. This insurance is already included in the price of the Diploma course. If you are a foreign student and from the European Community, we recommend that you start the procedure to obtain the European Health Insurance Card, since it’s not possible to apply for the NIE (Foreigner Identification Number) for bureaucratic reasons. You can find here information about how to apply for a health card. If you are a foreign student from outside the European Community, you have the option to apply for the NIE (Foreigner Identification Number), which gives you access to the public health care system. You can find here information on how to request it. However, to request a visa you will probably be asked to have a private insurance. – 360 Hostel, close to school and with a special discount for you! Contact them info@360hostelarts.com indicating “PROMO 15% Moveo”.